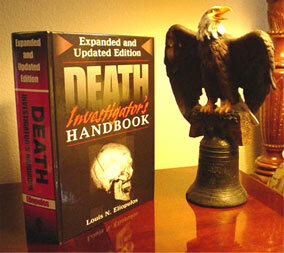 When Louis Eliopulos wrote Death Investigator’s Handbook in 1993, it was the first manual to combine information from dozens of scientific and technical manuals into one easy-to-use reference specifically for homicide investigators. It became an instant classic and is currently used by homicide divisions in federal, state and local law enforcement agencies (including the FBI); the investigative agencies of the U.S. armed forces; medical examiners and coroners across the United States and around the world; and criminology departments at many universities. But a lot has happened since it first appeared. This expanded and updated edition brings death investigation up to the minute. It contains 50 percent more material than the original and reveals all the new scientific and technical developments in the field of death investigation, including the very latest on DNA, cold cases, bioterrorism, mass disaster sites, illuminating sources for revealing stains, profiling secrets and much, much more. Interest in forensic medicine has never been higher. Professionals are faced with the need to solve more cases in less time and with fewer resources, and through popular television shows, movies and true-crime and mystery books, the public has become fascinated with every aspect of homicide investigations on the scene and in the lab. If you want to know more about the art and science of crime-scene processing, forensic evaluations and investigative techniques, go to the source that professionals use to catch real killers: Death Investigator’s Handbook. About The Author: Louis N. Eliopulos is a senior homicide investigations analyst with the Naval Criminal Investigative Service (NCIS), where he reviews, consults and suggests investigative analysis and strategy on active and cold-case homicide investigations from all over the world. Before being employed by NCIS, Eliopulos was chief forensic investigator for the medical examiner’s office in Jacksonville, Florida. He served as a forensic consultant for the teams recovering the remains from the Pentagon after the September 11, 2001, terrorist attack.